Father’s Day has restaurants lining up specials left and right, making it tough to choose where to eat. Melo’s however, dangled a super magical word in my face that made me want to try their’s immediately – WAGYU. A steakhouse that made its name with Certified Angus Beef, Melo’s knows that there’s nothing quite like a well-made steak to make dad happy. Hence, their special Steak ala Dad. I choose you Wagyu! Forever and ever! 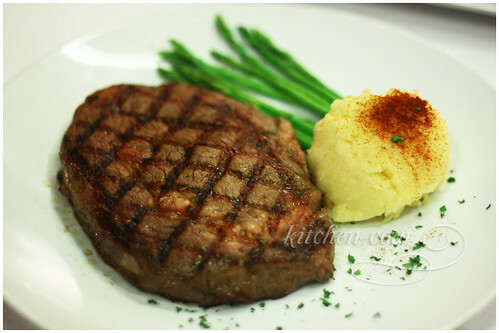 The Steak Ala Dad takes premium Australian grade 8 wagyu tenderloin, a grade that translates to high marbling, then wraps the sides in bacon, as a lot of filet mignons are prepared. While the tenderloin is the softest cut of beef, it is also tends to have a milder flavor. To compensate, it is usually sauced. In this case, with a full-flavored porcini mushroom sauce that brings out the cut’s meatiness. Prepared medium rare as I requested, Steak Ala Dad combined rich flavors from the sauce and the tender cut of the wagyu tenderloin. Served atop mashed potatoes and steamed vegetables, it makes for a satisfying, filling meal. Not just for Dads, I’d say. Everyone will surely love this. Aside from the Steak Ala Dad, Melo’s also paraded a variety of steaks that evening, during a quick discussion on steak appreciation. There’s the ribeye, a marbled cut that’s tender and very flavorful, complements of the fat that’s marbled through the meat. My personal favorite. The striploin is lean and meaty. It offers a bit more resistance than the tender cuts, perfect for those who like a bit of resilience with their steak. There’s the T-bone which is has striploin on one side, and less than a golfball diameter’s width of tenderloin on the other side. Being close to the bone, it’s more flavorful than the other cuts. 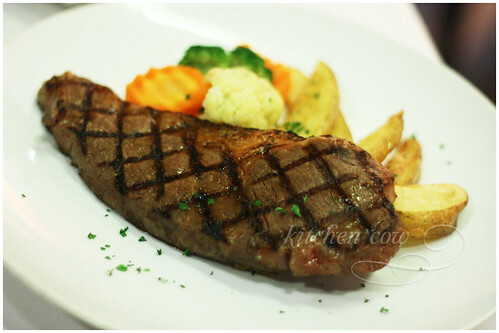 Finally, there’s the porterhouse, which is a combination of striploin and tenderloin. 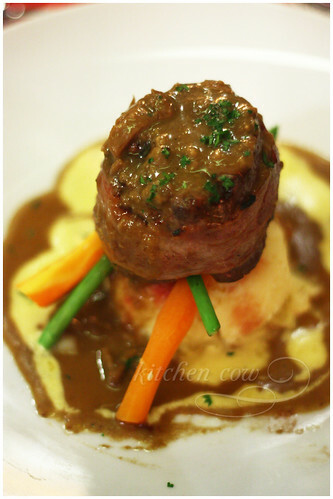 It’s like having two steaks in one, with the meaty striploin and the very soft tenderloin. 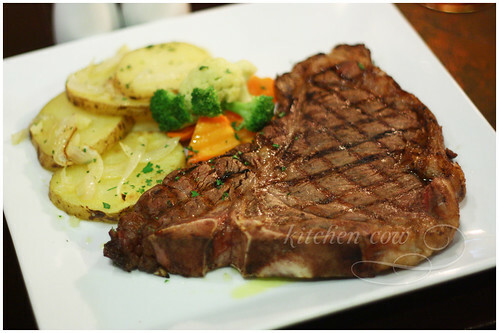 Like the T-bone, it has added flavor, due to its being close to the bone. Most of Melo’s steaks, from their USDA certified Angus to their prime grade Australian Wagyu, are available from their steak cart. These carts are wheeled from table to table, letting patrons choose the cuts and thickness they want. It’s a personalized experience that takes a customer’s wishes seriously. How do you end a dinner this good? Sweetly! This entry was posted in restos & eateries, sponsored events and features and tagged alabang, angus, beef, certified, dessert, greenhills, makati, manila, melo's, philippines, santiago, steak, steakhouse, sweet bella, wagyu, westgate. Bookmark the permalink. Love Melo’s! I like it better than Elbert’s. I don’t eat beef much but those sure look grrrrrr. Sarap. do you know what’s the name of the steakplace in ugong, pasig? the one before the skyway going to Libis? Really? Wow, big statement. I haven’t tried Elbert’s but I’ve been meaning to. Now you have me really curious, especially since Elbert’s is loads more expensive. Sorry, but not familiar with it. Not my area so I never get to explore Is it good? Maybe it’s cos we had wagyu at Melo’s. Even when the steak turned cold, it was still soft and delicious. With Elbert’s (last time I checked, they didn’t have wagyu), after a while, the steak got a little tough to chew. I dunno, I just really like wagyu’s texture and how it melts in your mouth. yumyum. I could compare because I ate in both restos the same week. @kao i think that is one of the earliest steakhouses in manila. FPJ and Erap frequent the place way back the 90’s. It was sort of famous before outback and tony roma. i can’t remember the name. i ate there before and all i remember was their beautiful gravy. which was not even a red wine reduction. Wow, pang celeb! It’s wonderful you were able to eat there then. Here’s to hoping you’d be able to visit it again, and SOON! hello kaoko! 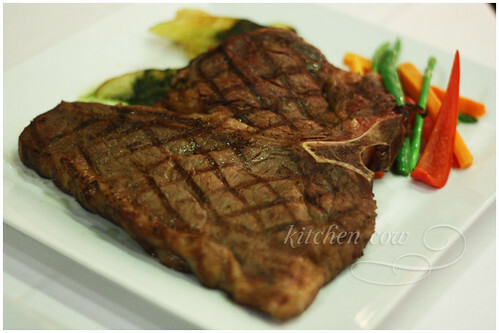 hope you don’t mind, i borrowed your porterhouse picture. will provide the proper attribution. if you don’t like it, i can easily take it down. see it on the Melo’s FB page.